NAIROBI, Kenya - Parts of southern Somalia are suffering from famine, a U.N. official said Wednesday, and tens of thousands of Somalis have already died in the worst hunger emergency in a generation. The Horn of Africa is suffering a devastating drought compounded by war, neglect and spiraling prices. Some areas in the region have not had such a low rainfall in 60 years, aid group Oxfam said. The U.N. needs $300 million in the next two months, said Mark Bowden, the U.N.'s top official in charge of humanitarian aid in Somalia. The last time conditions were this bad was in 1992, when hundreds of thousands of Somalis starved to death. That famine prompted intervention by an international peacekeeping force, but it eventually pulled out after two American Black Hawk helicopters were shot down in 1993. The southern Somali regions of Bakool and Lower Shabelle regions are suffering from famine, Bowden said. Across East Africa, more than 11.3 million people need aid, the World Food Program said. 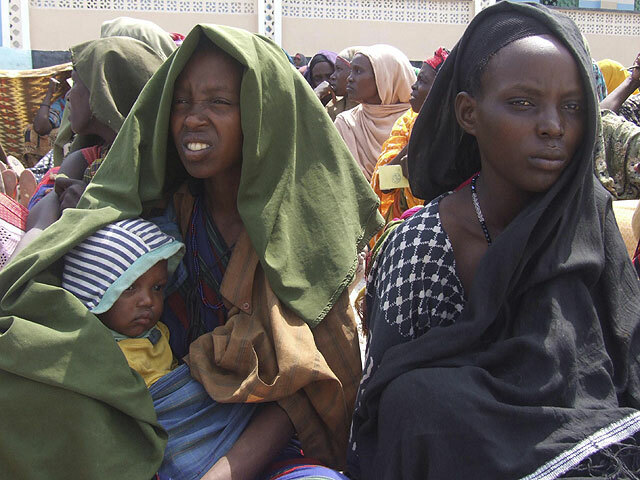 "Somalia is facing its worst food security crisis in the last 20 years," Bowden said. "This desperate situation requires urgent action to save lives." Famine is officially defined as when two adults or four children per 10,000 people die of hunger each day and a third of children are acutely malnourished. In some areas of Somalia, six people are dying a day and more than half of children are acutely malnourished, Bowden said. Prices of staple foods have increased 270 percent over the last year. "If we don't act now, famine will spread to all eight regions of southern Somalia within two months, due to poor harvests and infectious diseases," Bowden said. "We still do not have all the resources for food, clean water, shelter and health services to save the lives of hundreds of thousands of Somalia." He said it was unlikely there would be any respite from the drought until the end of the year. The drought has killed up to 90 percent of livestock in some regions, Oxfam said. But poor governance is also to blame. Most of Somalia has been wracked by civil war since its last government collapsed in 1990. Islamist rebels currently hold most of southern Somalia. They banned most aid agencies from working there two years ago but rescinded the ban earlier this month. Somalia is the most dangerous country in the world to work in, according to the U.N.'s World Food Program, which lost 14 relief workers in the past few years. Looting and attacks on aid convoys occur frequently. WFP head Josette Sheeran said the group is willing to return to southern Somalia if the insurgents guarantee safe passage. "We are absolutely fully committed to going where the hungry are," she said. The weak, U.N.-backed Somali government regularly comes last in the world in the annual corruption rating by watchdog Transparency International, but Bowden said it had welcomed the U.N.'s efforts and was working closely with aid groups. Neighboring Djibouti, Ethiopia and Kenya have also been badly affected, and Eritrea is also believed to be hard hit, though its repressive government does not release figures. Oxfam says the drought has been exacerbated by poor governance and neglect, war in Somalia and land policies that restrict grazing land for nomadic communities. Oxfam criticized those policies in a report released Wednesday, but also said several rich European countries should do more to provide emergency aid. The aid agency says there is an $800 million shortfall in funds. They say $1 billion is needed to fund relief efforts through January. Oxfam Regional Director Fran Equiza released a statement Wednesday saying it was "morally indefensible" that countries have only pledged $200 million in addition to long-running programs. On Wednesday, U.S. Secretary of State Hillary Rodham Clinton said the U.S. will give another $28 million, on top of the $431 million in assistance it has given to the Horn of Africa this year, which Clinton said was simply "not enough." Britain has pledged $145 million in the past two weeks  about 15 percent of what is needed  and the European Union pledged around $8 million, with more expected in coming days. Spain has promised nearly $10 million and Germany around $8.5 million but Oxfam said France has so far not pledged any more money and Denmark and Italy have said no significant new sums are available. "There is no time to waste if we are to avoid massive loss of life," Equiza said in a statement. "We must not stand by and watch this tragedy unfold before our eyes. The world has been slow to recognize the severity of this crisis, but there is no longer any excuse for inaction." Some donors, like the U.S., have expressed fears that aid might be diverted by Islamist groups. But Bowden said the U.N. had done its utmost to minimize the risks that aid might be diverted.